Magee, George E 21 farmer X July 11, 1840 Sept. 6, 1862 Washington DC 108048204 died of wounds per Oct. 15, 1884 reunion photo. died of wounds per Oct. 15, 1884 reunion photo; per ACWRD, died of wounds rec. at 2nd Bull Run wounded on 8-29-1862; also birth info; buried in Plaingrove Cem N. Lawrence Co., PA.
Magill, William T. A 20 Washington Co., Hopewell PA Washington Co., PA Sept 19, 1840 16-Aug-1923 Buffalo PA 92347553 Wounded in ankle but recovered. Per ACWRD: wounded at Cold Harbor June 2, 1864; and birth date info. Mahew, James D 19 light 5' 8 1/2" grey sandy farmer Ward Co., Va. May 27, 1864 North Anna River VA 14776131 INSERT LINK per ACWRD, died from wounds to chest at North Anna River, VA 5-25-1864. Mahue, Reuben G 22 1839 1890 Oceola Mills, Clearfield Co. PA Not found Buried in Sanborn Church Cemetery, "Nayhue"? Malarky, George F 30 dark 5' 10" grey black laborer Pulaski, Pa. April 14, 1866 New Bedford, Lawrence Co. PA 42851875 Per ACWRD, wounded at Petersburg, June 30, 1864; severe wound in left arm--amputated; death info and buried in Hopewell Cemetery. Malarky, Henry F. F 21 florid 5' 8" grey dark farmer Jefferson Twp., Pa. July 30, 1864 Petersburg VA Not Found Per ACWRD, died in the mine explosion 7-30-1864 (Battle of the Crater). Mallon, Henry D 21 fair 5' 5 1/2" blue brown miner Ireland Not found No other information found. Malone, James M 23 Not found On 3/6/1865 he mustered as a substitute into "M" Co. PA; He deserted on 5/19/1865. Maloney, Richard D 25 laborer 13-Aug-1918 Dayton OH 945379 No other information found. Mars, James A. B 19 Stoneboro PA before 1890 Not found Deserted June 12/65 at Tennalystown, D.C.; Widow Rose in 1890 census. Marscher, Conrad K 44 Not found On 3/4/1862 he mustered into "K" Co.
Marsh, Jon A 18 March 25, 1865 Petersburg VA X 16060803 On 1/16/1862 he mustered into "A" Co.
Other Information: born 3/1/1846 in Portersville, PA; (Son of Joseph and Julie Stoughton Marshall. Wife: Mary Elizabeth Dougherty); After the War he lived in Harrisville, Butler Co, PA Or Irwin Twp, Venango C; wounded right ankle per 1890 census info. Marshall, Wm. 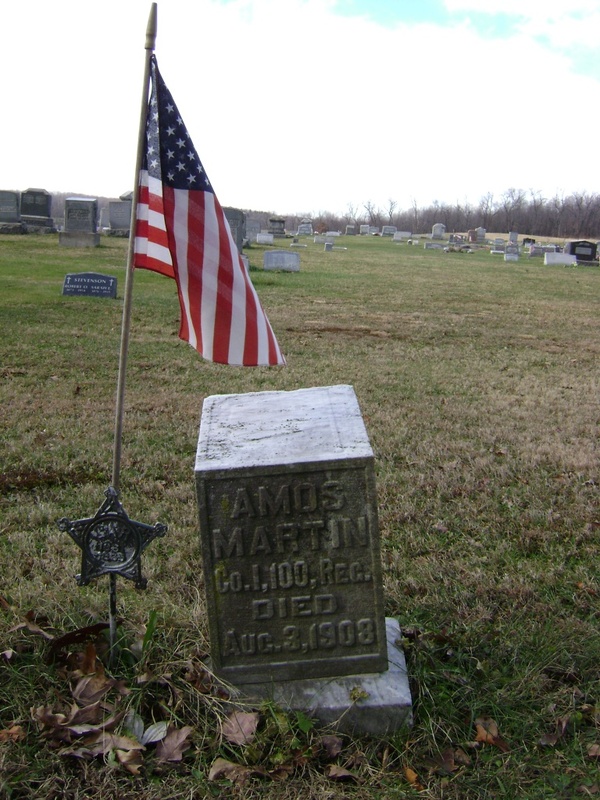 P. H 21 4-Apr-1914 IN Not found On 8/31/1861 he mustered into "H" Co.
Martin, James M. D 21 dark 5' 9 1/2" blue dark cabinetmaker Penna. Feb 21, 1841 19-Oct-1903 Shelby MT X 89661667 Per ACWRD, 1861 volunteer--reenlisted 1864, discharged July 24, 1865 for disability, death date/location, burial in Greenwood Cemetery, New Castle, PA; middle initial stands for "Milton". 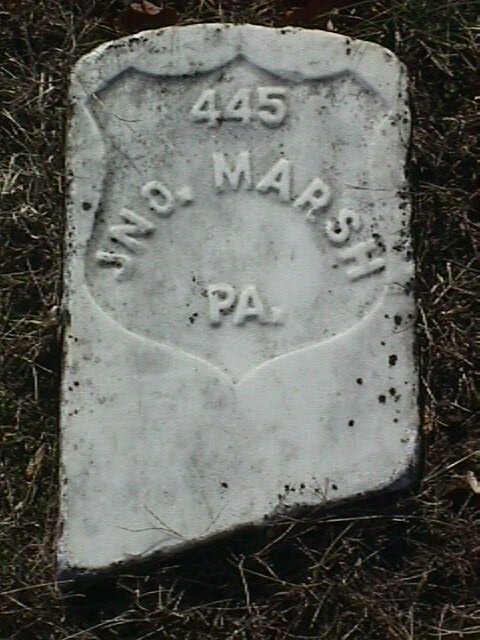 Martin, John F 21 Not found Per ACWRD, 1864 draftee mustered out with regiment in July 1865. Martin, John H. E 21 April 8, 1844 May 16, 1864 Spottsylvania CH VA 18666794 died of wounds rec May 12, 1864; wounded in leg, leg amputated; per ACWRD buried in Scott Twp, Lawrence Co. PA, Covenanter Cemetery; different birth info on ACWRD which lists birtth in 1837--suspect this is incorrect. Martin, Patrick D 21 light 5' 5" grey brown laborer Russia not found Per ACWRD, 1865 Substitute, deserted 5-5-1865. Mayberry, Curtis E 20 dark 5' 5 1/2" black black Tailor Centreville, PA May 14, 1870 Eastbrook PA 37160443 died per Oct. 15, 1884 reunion photo. 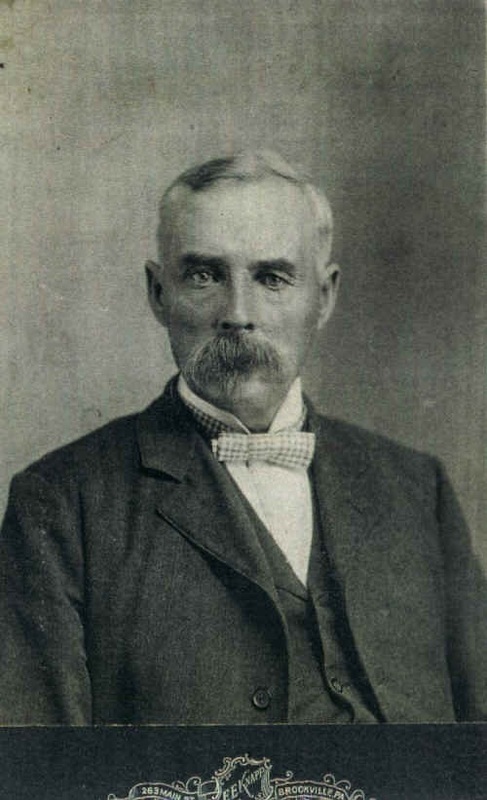 died per Oct. 15, 1884 reunion photo; buried in Palestine, OH per ACWRD. Wounded 6-17-1864, at Petersburg, VA amputated right arm. ; death in 1876? ; service information on gravestone (newer) is incorrect from findagrave site photo. Mayberry was never in the 50th PA Vols, Co. I., based on review of 50th PA records. M'Birney, Joseph B 28 June 2, 1864 Cold Harbor VA Not found (illegible card); ACWRD lists him as POW at Cold Harbor, June 2, 1864.
born 9/30/1844 in Philadelphia, PA; birth date on gravestone shows 1832. M'Cabe, Thomas K 45 Not found On 8/31/1861 he mustered into "K" Co.
M'Calister, Wm. M. K 30 August 1862 Bull Run, VA Not found killed in action. M'Call, Charles B 28 Not found 1865 Substitute; POW date unknown. M'Camic, Cicero D 21 fair 5' 10" black sandy laborer not found No other information found per ACWRD. M'Canders, Mark M 44 Not found No other information found per ACWRD. M'Cartney, George E 30 Not found Per ACWRD, 1865 substitute--deserted 6-2-1865. M'Caslin, John E 19 Center Co., PA Aug 16, 1842 June 16, 1862 James Island SC Not found killed per Oct. 15, 1884 reunion photo. Per ACWRD, birth info. M'Caughan, Sam'l M 39 April 23, 1885 Buena Vist; Allegheny Co. PA Not found On 9/5/1861 he mustered into "M" Co.
M'Cauley, John'n G. K 21 Sept. 11, 1862 Washington DC X 34468448 On 9/15/1861 he mustered into "K" Co.
M'Causlin. Max'll. K. A 22 6-May-1928 Grand Prairie TX not found No other information available per ACWRD. 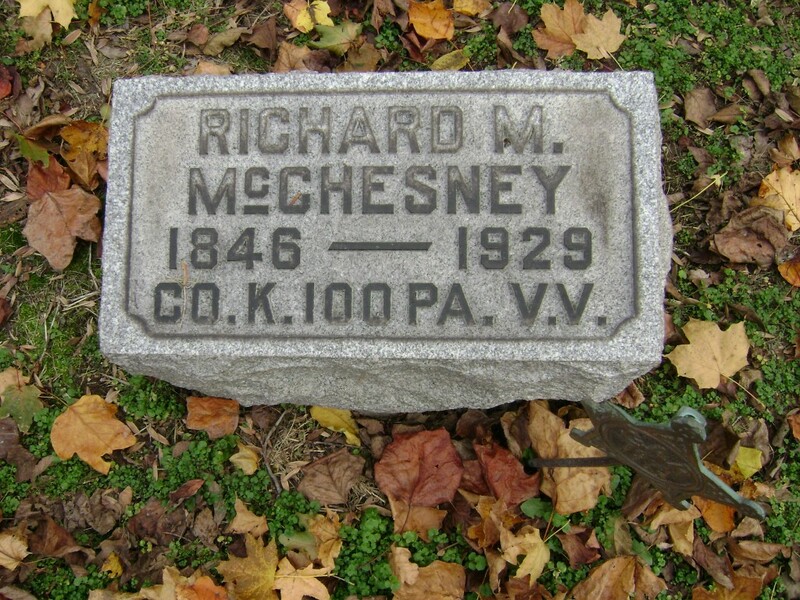 M'Chesney, Rich'd K 21 1846 21-Mar-1929 New Castle PA X buried in Oak Park Cem. M'Clain, Robert B. B 24 West Middlesex PA Beaver County, PA July 13, 1837 17-Feb-1908 Middlesex PA Not found Enlisted and mustered in on 8/31/1861 as a Private into "B" Co. PA 100th Infantry--He was Mustered Out on 7/24/1865. M'Clarren, Charles F 19 light 5' 5" hazel light farmer Marion Twp., Pa. not found Per ACWRD, 1864 recruit--no other information available. 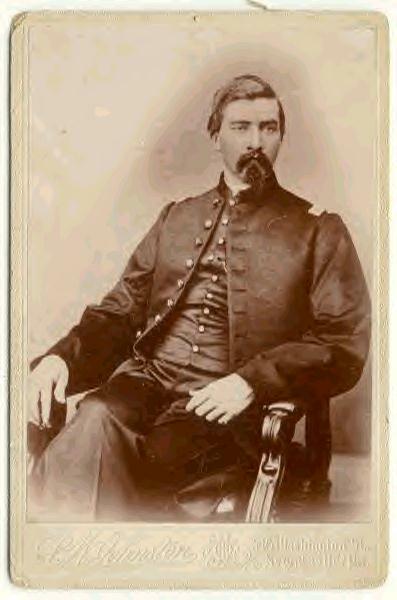 M'Clarren, George F 24 Sept 14, 1862 South Mountain MD X 43420933 killed in action per historic newspaper casualty list. M'Cleary, Eben S. H 28 Washington, Lincoln Post #3 D.C. 1832 1905 Washington DC X 39830601 buried in Rock Creek Cemetery, Washington D.C.; became Hospital Steward in 1863. M'Clelland, Geo. A 23 not found Per ACWRD, POW June 2, 1864, Cold Harbor. M'Clure, George G 21 Mercer Co. Sandy Lake PA Feb 20, 1840 8-Nov-1915 Pittsburgh PA Not found on 8/31/1861 he mustered into "G" Co.
M'Clure, Hiram W. C 20 laborer Butler Co., Worth PA 1843 14-Nov-1918 Worth Twp. Butler Co. PA not found Middle name "Westley"; ACWRD lists birth year and genealogy info; buried in Mt. Union Cem, Worth Twp, Butler Co., pA; after war lived in W. Liberty. M'Clure, John R. A 32 not found No other information from ACWRD. M'Comb, Andrew B 19 Dec. 14, 1861 Beaufort SC Not found Died Dec. 14, 1861 at Beaufort, S.C. of typhoid fever. M'Common, James E 19 Lawrence Co. New Castle PA Ireland Feb 18, 1846 July 14, 1881 Plaingrove Twp, Lawrence Co PA X 70379964 Per ACWRD 1864 enlistee; finger shot off, widow Mary J. in 1890; wounded at Cold Harbor, June 2, 1864. M'Connell, Benoni E 18 fair 5' 6 1/2" grey dark clerk Allegheny County, Haysville OR Beaver Co. pA July 15, 1847 19-May-05 Haysville, Butler Co. PA X Not found X 1864 recruit; wounded in throat at Cold Harbor, June 2, 1864. Also wounded at Spottsylvania CH, VA 5-12-1864; per ACWWRD birth and death info. M'Connell, James A. E 19 dark 5' 11" grey black farmer April 5, 1845 24-May-1913 New Castle PA Not found Per ACWRD, wounded 5-28-1864, North Anna River, VA; also had service in VRC. 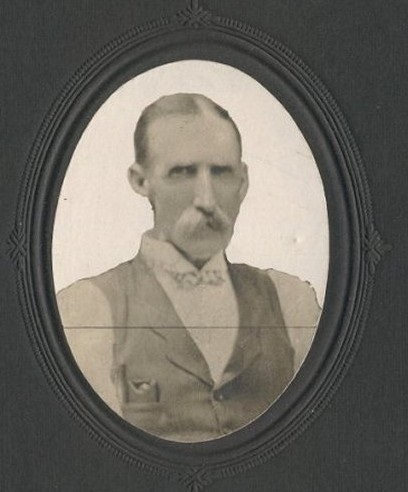 M'Coy, Joseph F. D 21 light 5' 9" brown light farmer Lawrence Co. Enon Valley PA Aug 10, 1844 20-Apr-1920 Warren OH 29962194 No other information found per ACWRD. 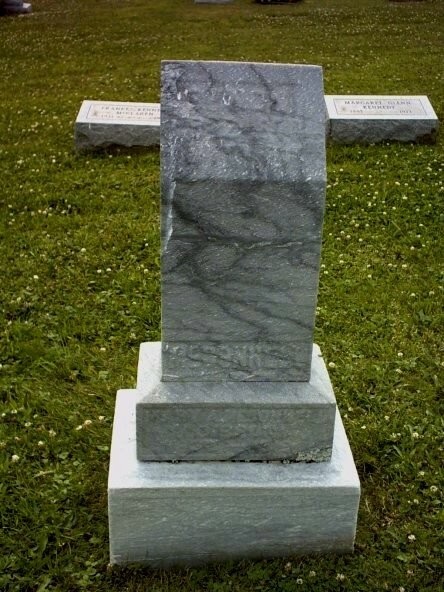 Findagrave.com info looks to be the same individual based on death date and location; apparently lied about his age at 1861 enlistment (21) as he was actually 17. M'Creary, Alex M. F 22 farmer Eastbrook, Pa. Greene Co., Franklin MO Aug 29, 1839 Jan 28, 1876 Springfield MO 40091000 Per ACWRD, deserted (date not stated); returned (date not stated). M'Creary, Joseph E 21 farmer Lawrence Co. PA Jan 7, 1842 24-Mar-05 Lake City, Calhoun Co. IA 19777287 Per ACWRD, birth location. M'Cullough, Jas. N. D 27 light 5' 9" brown light moulder 11-Apr-1913 not found No other information found. A James McCullough died in 1913 in Crawford Co. IA per findagrave.com info. Need more evidence to confirm. M'Cullough, Sam'l. A 21 15-Oct-1918 Dewey OK not found ACWRD lists info mistakenly lists information for McCullough..correct name for info is Ebenezer McElroy. (Died age 66. ); After the War he lived in Sharon, PA; 3rd husband of Abigail "Abby" Lawrence. M'Cutcheon, Wm. E 19 dark 5' 7 1/2" hazel black painter Crawford Co. Titusville PA Mercer Co. PA May 1, 1846 26-Jul-1926 Titusville PA Not found Per ACWRD, birth info and wounded at Fort Stedman, VA 3-25-1865. M'Donald, John H 18 Warren Co.; Watson 21-Oct-1921 Grand Valley PA Not found Was taken prisoner 30th July, 1864; was in Libby Prison, 3 days balance of the time in Danville, NC; was paroled Feb. 24, 1865; Was in prison 6 months 25 days. 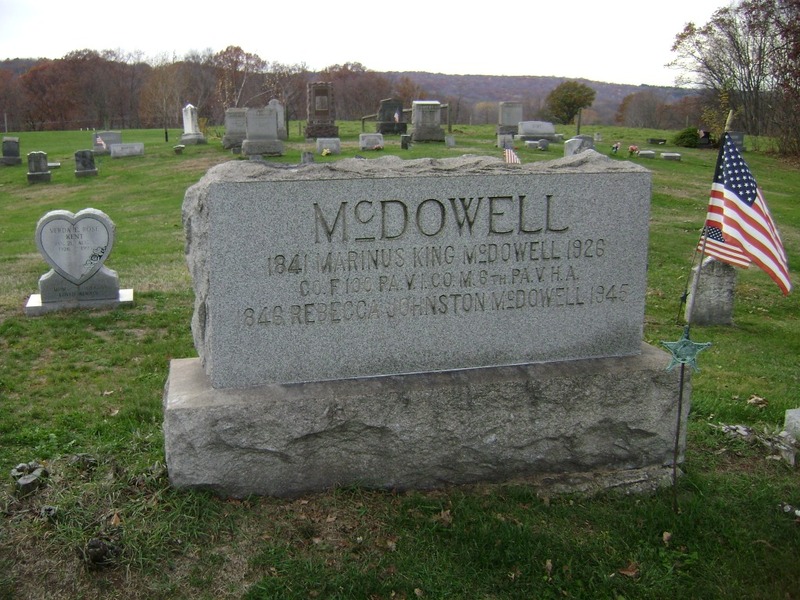 M'Dowell, Marinus K. F 20 farmer Eastbrook, Pa. Lawrence Co.; Hickory Twp. PA 1841 1926 Lawrence Co. PA X 16059945 X Roundhead in SC Middle name "King", also officer in 6th PA Heavy Artililery; buried in Briar Hill Cem, Lawrence Co. PA; shot in right leg--ball lodging in thigh. Meanor, George W. C 17 light 5' 8" hazel light laborer Allegheny Co., Corapolis PA Beaver Co., Pa. Not found 1864 Recruit; no other information found per ACWRD. M'Elroy, Eben'r B. A 22 Sept 17, 1842 4-May-1901 Eugene OR X 19105992 No other information available per ACWRD. ACWRD lists EB McElroy info as Samuel McCullough. M'Elwain, John C Elwood (near) PA not found ACWRD lists death location and burial at Nye Cemetery. M'Garvey, Win. B. A 18 Butler Co., Fairview PA Armstrong Co., PA around 1847 30-Sep-1905 not found 1865 Substitute, possible death date of Sept. 15, 1946! M'Geehan, John D 24 farmer 1831 11-Oct-1911 Connargo TN not found ACWRD, birth info. M'Gill, Joseph A 24 Astoria OR March, 1837 11-Jun-1911 Washington Co. PA 64783316 Wounded in right leg at Petersburg, VA, June 17, 1864; lived in OR for 19 years. 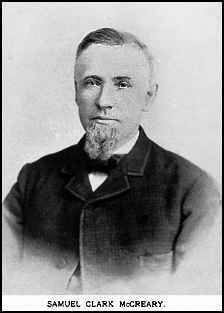 M'Ginnis, John C 22 fair 5' 5 1/2" blue dark boiler Canada not found 1865 Substitute, deserted 5-15-1865--no other information found. M'Gowan, William C 24 farmer Dec 21, 1861 Beaufort SC not found died of typhoid fever; listed as McGorran. Miller, Agustus F 28 dark 5' 5" brown brown laborer New Castle, Pa. Portage Co. Shalersville OH Binghamton, Broome Co. NY May 1833 27-Aug-1903 Ashtabula Co. Jefferson OH X 62053564 sunstroke; ACWRD reports his birth as May 5, 1825. Miller, Charles M 30 3068382 On 3/21/1865 he mustered as a substitute into "M" Co. ;He deserted on 6/14/1865;(Buried in National Cemetery, Richmond, VA. Division; 1, Section B, Grave 75. 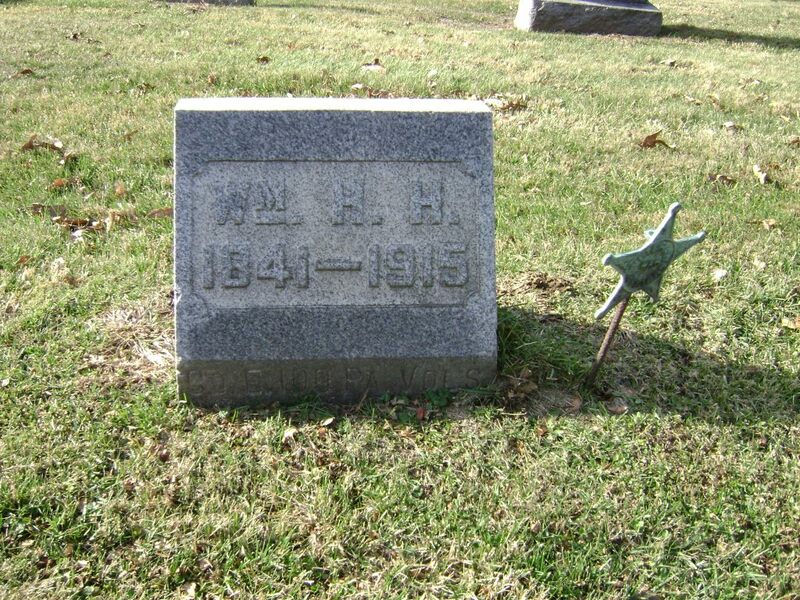 ); possible match on findagrave info as date of death matches date of desertion--need more information to confirm. 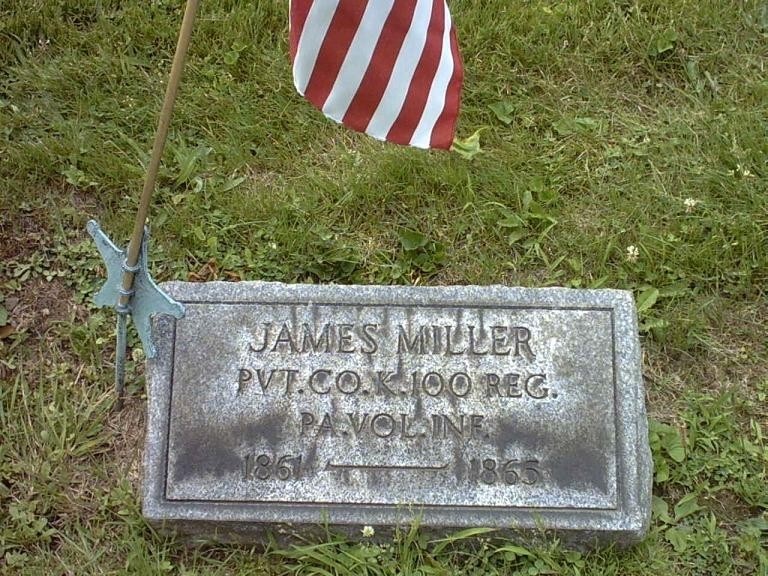 Miller, David F. F 18 fair 5' 6 3/4" blue dark farmer Scott Twp., Pa. Cheboygan Co., Quillian River MI Beaver Co. PA Feb 2, 1845 24-Mar-1919 Petoskey MI X 26720819 buried in Sheboygan Co. Ohioville Cem; gunshot in left waist; per ACWRD birth date and location; after war lived in Elonson, Emmit Co. MI; wounded at Spottsylvania CH 5-12-1864 and Fort Stedman 3-25-1865; discharged 6-7-1865 at hospital. Miller, Edward Unacc not found On 2/18/1864 he mustered into Unassigned--no other information available. Miller, John A. D 26 Bedford Co. PA January 19, 1839 12-Jul-1912 Bedford Co., West St. Clair Twp, Alum Bank PA X 60627992 On 7/19/1864 he was drafted into "D" Co.; He was Mustered Out on 7/24/1865; buried in Pleasantville Cemetery., wife Elizabeth Hartle. 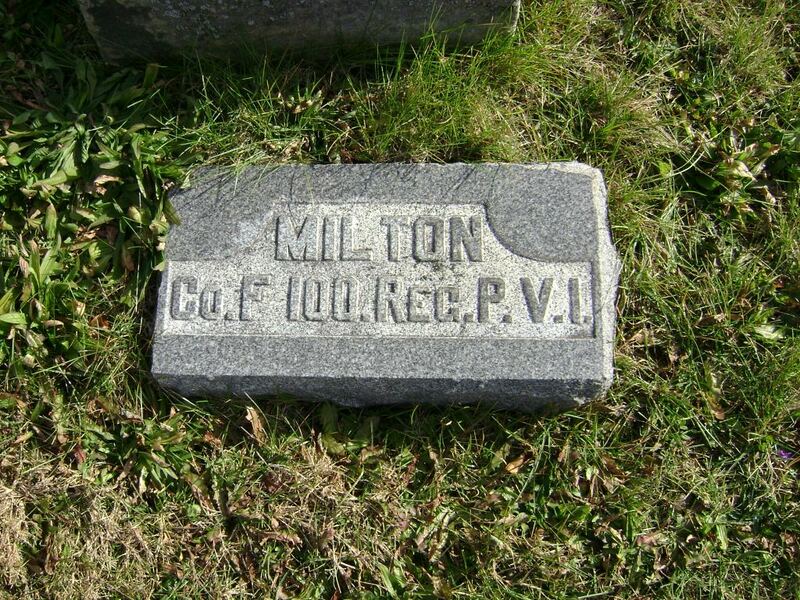 Miller, John C. C 19 Sept 14, 1862 South Mountain MD X 41834731 killed in action; buried in Antietam Nat. Cem., grave # 3,884. Miller, Julius P. A 22 Washington Co., Washington PA Hopewell Twp, Washington Co. PA May 22, 1839 8-Mar-1909 Not found Per ACWRD, wife Harriet and Pvt Miller had 10 children. Miller, Thomas M. C 24 farmer July 29, 1864 Petersburg VA not found killed in action. Miller, William H. D 41 New Castle PA not found Per ACWRD, 1864 Draftee, buried in Oak Park Cem, New Castle, PA Lawrence Co.
Miller, William J. G 33 11-Oct-1920 Leavenworth(Nat Mil. Home) KS Not found On 10/16/1862 he mustered into "G" Co.
Minner, Robert D 23 light 5' 11 1/2" blue sandy laborer Lawrence Co. Enon Valley PA Pa. 1840 28-Sep-1917 Salem OR not found "Miner"? ; wife Nancy Jane. Mires, Christian L. E 24 Not found Per ACWRD, 1865 draftee--deserted. Also spelled "Myers". M'Kain, John C 23 farmer Center Co. PA Oct 15, 1862 VA 3256198 Per ACWRD, wounded at 2nd Bull Run, VA 8-29-1862; burial record 4-23-1864 (likely incorect), Alexandria, grave 1,827; birth location; findagrave info likely match based on same death date as pension card. ACWRD death date incorect; findagrave lists grave # as 1825. M'Kee, William J. F 20 farmer New Castle, Pa. Neshannock Twp, Lawrence Co, PA Jan 5, 1843 June 24, 1862 James Island SC not found Per ACWRD, may have died as a result of wounds rec. at James Island, SC 6-16-1862 (Secessionville). M'Keever, Alex'r C. A 18 17-Aug-1926 Humboldt KS not found Per ACWRD, buried in Elmwood Cem, Kansas City; after war lived in Portland, OR. M'Keever, James A 22 28-Sep-1915 Hopedale OH not found ACWRD lists as Hopedale, PA.
M'Keever, John B. A 28 July 30, 1864 Andersonville GA not found POW at Wilderness, May 6, 1864 per ACWRD. M'Keever, Thomas A 21 August 13, 1862 Potomac River--Drowned VA not found ACWRD allso lists him as wounded 6-30-1862. M'Kinley, Thos. J. D 20 light 5' 6" blue grey farmer Penna. not found 1864 recruit, no other information found per ACWRD. M'Knabb, Robert L. B 33 X 1880 Lawrence Co. PA X 42839895 Discharged Nov. 29/62 for disability, Pulaski Cemetery, Lawrence, Co.
M'Knight, Wm. S. F 24 farmer Eastbrook, Pa. June 4, 1862 James Island SC not found killed in action per historic newspaper casualty list. M'Lean, Jackson F 21 light 5' 9 3/4" blue brown laborer New Castle, Pa. Ireland July 30, 1864 Petersburg VA not found Per ACWRD, killed at the Mine Explosion, 7-30-1864 in Petersburg, VA.
M'Masters, Henry .P. F 28 22894746 Per ACWRD, deserted 3-30-1863. After war settled in Weston, WV; findagrave info shows Henry McMasters in Walkersville, WV cemetery, only 18 miles away--possible match. M'Murray, Thomas M 22 not found On 3/7/1865 he mustered as a substitute into "M" Co. ;He was Mustered Out on 7/24/1865. Moloney, John A 28 not found Per ACWRD, discharged on 12-19-1863; no other information found. Montgomery, Geo E 27 Farmer Lawrence Co. Plaingrove Twp. PA Hillsville, PA April 25, 1838 March 18, 1891 Mt Pleasant, Lawrence Co. PA X 70612261 X Per ACWRD, buried in Mt. 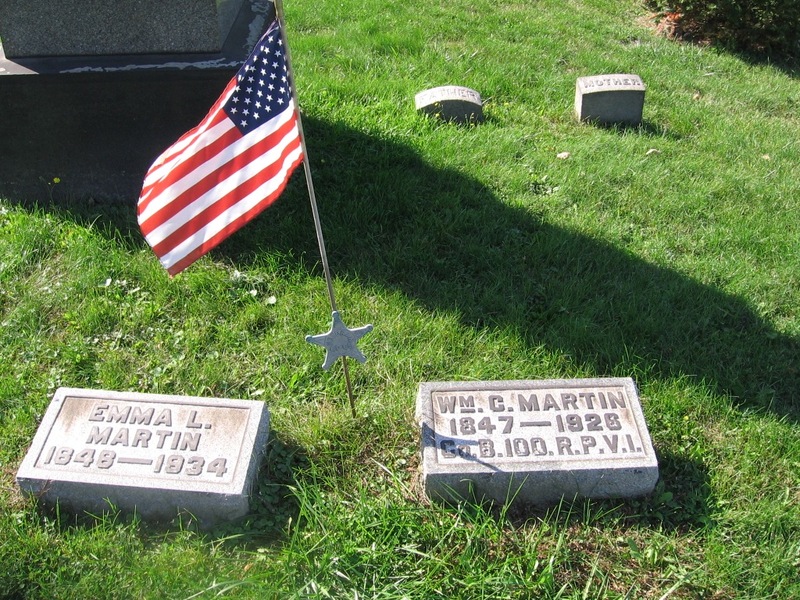 Pleasant, PA; birth location; per photo of gravestone and listing information on findagrave.com, there is no listing of service in Civil War, including no GAR marker; obituary info on findagrave indicates he died after buggy accident. Montgomery, J. M. K not found On 12/8/1863 he mustered into "K" Co.
Moore, George W. K 25 not found Per ACWRD. On 3/11/1865 he mustered as a substitute into "K" Co.; He deserted on 6/28/1865. 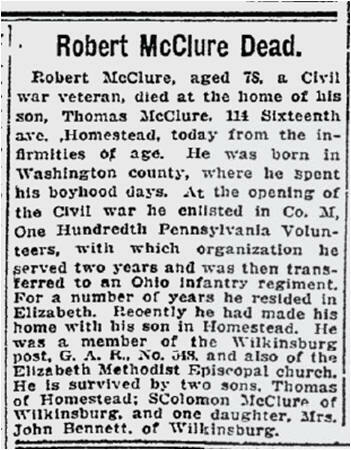 Moore, Joseph C 49 farmer Allegheny, PA Dec 15, 1812 Feb 2, 1892 North Liberty PA X 18681358 ACWRD has deathdate of 3-4-1885; buried in Wolf Creek; 1890 census info states widow Margaret living in Plaingrove Twp, Lawrence Co.
Moore, Samuel F. B 24 Feb 15, 1837 28-Aug-1904 Gentry Co. MO 18235025 Discharged Mar. 20/ 62 for disability; pension card death date matches findagrave info as does birth date to age at enlistment--likely match. Morehead, Ethan S. K 22 Nov 10, 1844 Feb 16, 1865 Petersburg VA X 18683433 X Pension card states he died Dec 20, 1891--incorrect. Morris, Evan K 32 Aug 29, 1862 Bull Run VA not found killed in action at Bull Run, VA; not sure of exact date--possible Aug 30 or 31, 1862. Morrison, Wm. 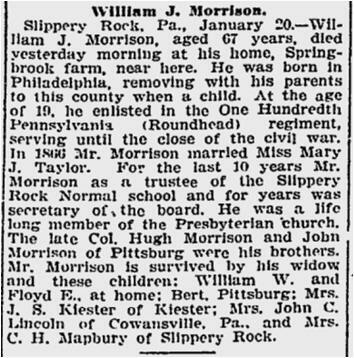 J. G 19 20-Jan-1910 Slippery Rock PA X not found On 9/15/1862 he mustered into "G" Co.
Moss, Michael H 20 15-Mar-1923 Mineral City OH On 2/23/1864 he mustered into "H" Co.
Mountain, Joseph G 21 July 11, 1864 Washington DC X 57899377 Wounded at Spottsylvania CH.died of thigh wound in hospital in Washington D.C. July 11, 1864 (see 6th paragraph from bottom on "Tavern on the Little Beaver Creek" page On 2/19/1864 he mustered into "G" Co.
Mountz, Enoch A 20 Washington Co., PA Nov 6, 1845 2-Nov-1918 Washington PA Not found Per ACWRD: On 2/16/1864 he mustered into "A" Co. PA 100th Infantry; He was discharged on 5/13/1865; wounded at Wilderness, May 5, 1864; birth info. Mowrey, Daniel B. A Washington Co., Strabane PA Pittsburgh, PA Nov 17, 1828 18-Aug-1905 Washington PA Not found Birth and death date information from ACWRD. Pension card lists death year as 1906. M'Peak, Andrew A 21 not found No other information from ACWRD. M'Quaid, Robert F. M 27 Marshall, Westmoreland Co, PA March 11, 1836 Aug 10, 1873 Not found On 10/4/1861 he mustered into "M" Co.
Mullen, Josiah A 25 2-Nov-1918 Des Moines IA not found No other information available per ACWRD. Murray, James T. C 18 dark 5' 7" brown black farmer Crawford Co., Athens PA Penna. 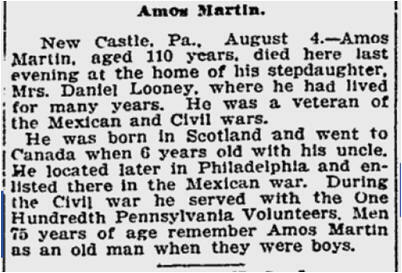 Oct 18, 1847 27-Sep-1916 Centerville PA 67411775 ACWRD lists birthyear as 1844--believe is incorrect. Likely twins with John T. Murray--both 18 YO at muster in. Murray, John F 22 Not Found Per ACWRD, 1865 substitute wounded at Fort Stedman, VA 3-25-1865; mustered out with regiment. Murray, Samuel C 22 laborer not found Per ACWRD, wounded--place and date not listed, discharged on 8-29-1863 for disability. No other data. M'Williams, Isaac I 23 25-Jan-1917 49258152 On 8/31/1861 he mustered into "I" Co.
M'Williams, I.P.C. G 21 Mahoning Co.; Youngstown OH Lawrence Co. PA Aug 5, 1842 28-Dec-1915 Youngstown OH Not found On 2/29/1864 he mustered into "G" Co.
Myers, Benjamin L. E 23 1907 not found On 2/22/1865 he was drafted into "E" Co.; He was Mustered Out on 7/24/1865 with the regiment. 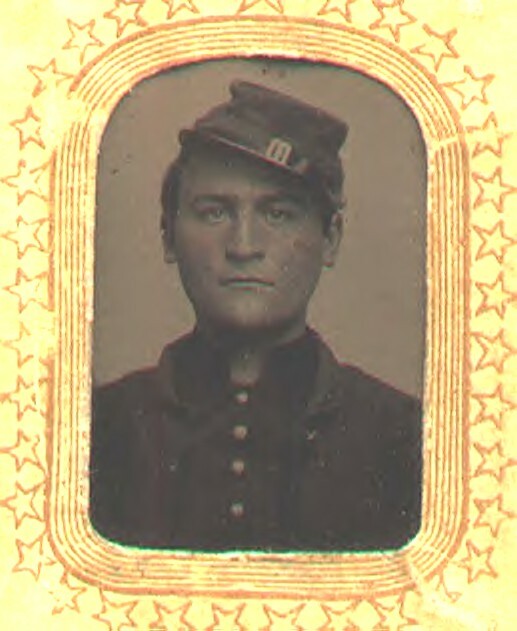 Myers, Christian F 21 Not Found Per ACWRD, 1865 draftee, deserted on July 7, 1865. Not sure if same Christian Myers as Christian D. Myers since their enlistments are shown to be 5 days apart--strange, especially since age at enlistment (21) is the same. Myers, Christian D. F 21 Not Found Per ACWRD, 1865 draftee POW at Fort Stedman. Not sure if same soldier as Christian Myers enlisted 5 days apart but same age (21) at enlistment. Myers, Israel E 18 Nov 4, 1845 unknown Marion Co. IN X 23514214 Per ACWRD, lived in Jolietville, Hamilton Co., IN after the war. ; 1865 substitute.